Under license of Universal Monsters comes the Funko Hikari Sofubi Japanese Vinyl hand-made and crafted Life Force Metaluna Mutant figure. Metaluna Mutant from the sci-fi/horror classic film This Island Earth joins the Funko Hikari line! This extraterrestrial monster features his veiny oversized brain and vicious claws, and is limited to 1,500 pieces worldwide. 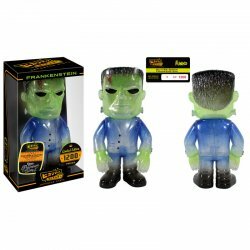 The Universal Monsters Metaluna Mutant Hikari Vinyl Figure comes packaged in a numbered window display box. It makes a great gift for any Universal Monsters fan! Ages 14 and up.